Islamabad, Pakistan – Hundreds of far-right protesters are marching on the Pakistani capital Islamabad, threatening to blockade the city unless the country cuts diplomatic ties with the Netherlands over a cartoon competition deemed to be blasphemous. The Tehreek-e-Labbaik Pakistan (TLP) party is protesting against a competition for cartoons depicting Islam’s Prophet Muhammad by far-right Dutch opposition leader Geert Wilders, a known provocateur. Physical depictions of God or the Prophet Muhammad are forbidden in Islam, and the TLP says the competition amounts to “blasphemy”. The TLP rose to prominence last November, when firebrand Muslim scholar Khadim Hussain Rizvi, the party’s founder, led a three-week blockade of the Pakistani capital over a minor change to an electoral oath that he said amounted to “blasphemy”. In Pakistan’s July general election, the newly formed party bagged 2.2 million votes in national assembly constituencies nationwide, making it the fifth most popular political party in the country. 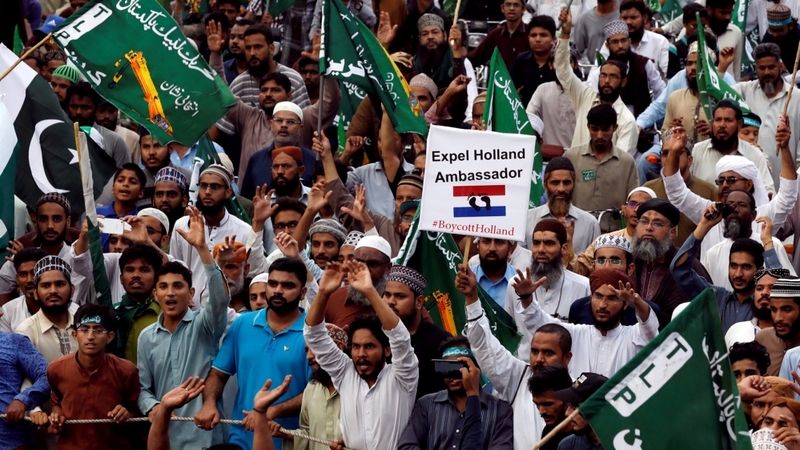 As the protest caravan of hundreds wound its way through Punjab province, the country’s political heartland, demonstrators carried banners condemning the Dutch government and Wilders and sang devotional songs. “For our Prophet’s honour, we will lay down our lives,” they chanted, video footage from the rally showed. Prime Minister Khan frequently referred to the blasphemy allegations raised by the TLP in November during his election campaign, and in his victory speech promised to run the country on the basis of the Prophet Muhammad’s governance of the Arab state of Medina in the 7th century. “They have made a promise during the election, they have promised to establish a state along the lines of Medina,” said TLP spokesperson Ashrafi.